I only knew Ilona and Cor Noorman by their "field list" (initials NL) in Willi Gertel’s Kompendium. 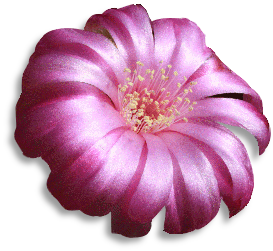 In early 2012, I was pleasantly surprised to receive an email from them, offering me a list of plants for sale. Having no NL number yet in my collection, I immediately ordered ! ! ! I took the opportunity to suggest a visit of their collection. The proposal was immediately accepted. Here is a little report of this visit. Then let’s move into Cor’s greenhouse. The first impression is the same as in Ilona’s greenhouse : everything seems perfect. The collection consists of about 2000 Sulcos. 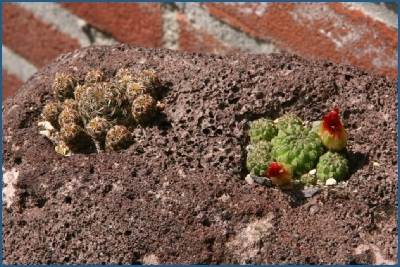 The challenge for Cor is to obtain plants having the same appearance as those that occur in nature in Bolivia. To achieve this goal, he “mistreats” his plants over and over. They only get one watering per month. If the temperature is really scorching, the rate is increased to a watering every 2 weeks. They are fertilized only once a year. They get no protection against the sun (but a very good ventilation). No heating during the winter. The proximity of the sea limiting negative temperatures, the minimum observed in the greenhouse is -3 ° C. This temperature has never caused any damage to the plants. And I thought I was too hard to my plants ! ! ! Despite these hard conditions, the plants are quite beautiful and healthy. Here are some photos to prove my statements ! Some findings of Cor and Ilona from their last trip to Bolivia. I spent a very pleasant afternoon in the company of Ilona and Cor who are very friendly people. Their collections are beautiful and healthy. It is always interesting to chat with other collectors. Certainly, you will learn things! It is with regret that I had to leave too soon to return to Belgium but with a well-filled stomach : it keeps a delicious memory of the piece of cake as big as a montain which I was served ! ! ! Sulcos on the rock ! ! ! Some material for the next plant list ! Ilona and Cor are a very well-matched couple : both of them love cacti ! ! ! Each of them has its own greenhouse. 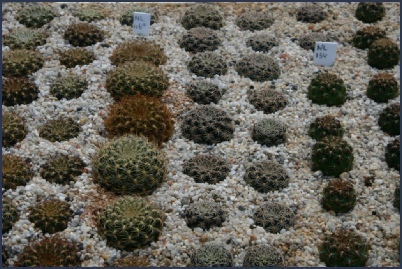 Ilona specializes in Rebutia (Aylostera, Mediolobivia, Digitorebutia ...) while Cor is a Sulcorebutia enthusiast. Their interest in cacti was born in 2001. Very quickly, they wanted to see these plants in their natural environment. In 2003, they're off to Bolivia. At the airport in Sucre they take a taxi to the hotel. Talking with the driver, he suggests to guide them to visit various sites in search of cacti. So, it is by taxi that they discovered their first sulcorebutias. In 2005, it is again in a taxi that they will make their second expedition in Bolivia. For the following trips (2006, 2008, 2009 and 2011) being more accustomed to the country it is in a rental car that they are traveling. These days, their "field list" contains more than 160 references. Given their young age, we can assume that this list will grow on in the future ! ! ! Let's start with Ilona’s greenhouse . What can I say ? The greenhouse is extremely clean, tidy and all the plants look very healthy. A perfect collection! ! ! Here are some views.